17th September 2018: This 2014 musical, book, music and lyrics by Kevin Murphy and Laurence O’Keefe, arrives in the West End after a sold out 8 week run at the Other Palace, based on the cult 1989 movie featuring Winona Ryder and Christian Slater. Up to the interval the show was a solid 3 stars but act two descends into mawkishness and feels positively crass at times, leaving a bad taste in the mouth, which would reduce it to just two stars if it wasn’t for the strength of the cast who are superb throughout. The world has moved on enormously since 1989 and elements of the show now sit very uncomfortably in 2018 after so many US high school shootings, the awareness of teenage mental health issues and prevalence of teenage suicides. 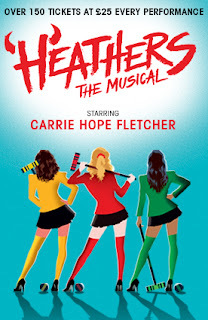 It works best if you forget the original film on which it is based and just enjoy it for the dark high school romp that it is, as although it follows the plot of the film reasonably closely, it feels sanitised by being turned into a musical. The show is saved by the high energy, quality and power house vocals of the hard-working cast and ensemble led by Carrie Hope Fletcher, her voice soaring and commanding attention throughout but particularly in Fight For Me and the newly added I Say No. However the relentless pop/rock belting from the female cast becomes rather wearing particularly in act two. In the Christian Slater role Jamie Muscato doesn’t really achieve the brooding intensity of the film as his role seems watered down to be be more sympathetic and the writers adding more of a backstory for his character just seems to add to the general mawkishness. However his act one Freeze Your Brain is a particularly standout along with the duet to youthful dreams Seventeen with Veronica which simply soars. A mention must also go to the fantastically versatile Rebecca Lock, playing all the adult female roles with a stunning vocal on Shine A Light. This is definitely a show for the fans, who were even dressed as their favourite Heather, but for this reviewer at least it all sat rather uncomfortably in spite of the strong performances.